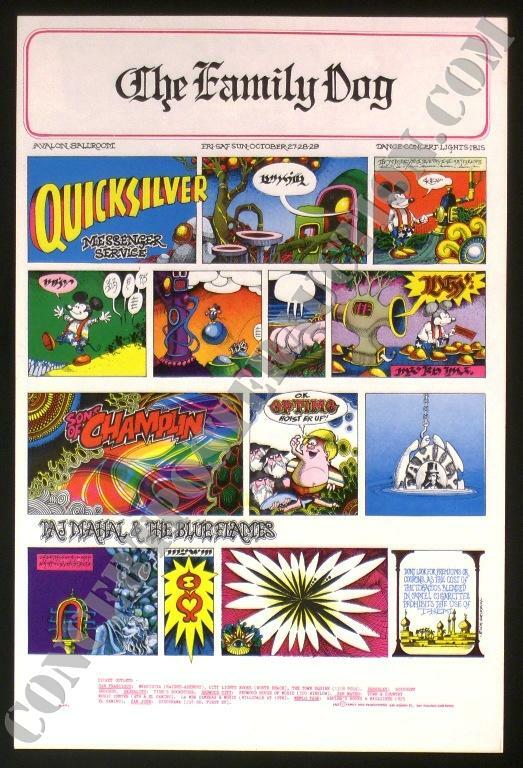 Official 1967/68 2nd printing 14 x 21" concert poster for Quicksilver Messenger Service with Taj Mahal and the Sons of Champlin at the Avalon Ballroom on 10/27-29/1967. Art by Rick Griffin, image ("Sunday Funnies") is #89 in the Family Dog/Avalon series. Medium-thin flat stock poster is in superb near mint (A- to A-/B+) condition; slight handling wear and a couple of miniscule edge dings, otherwise very bright and clean. One of Griffin's most intense late '67-early '68 pieces.